Squashes were important American Indian staples. The Indians not only ate squashes, but they used the gourds to make water jugs, bowls, and ceremonial masks, and they wove the stringy fibers of some varieties into cloth. Squashes come in so many colours, shapes, sizes, and textures that they defy simple description. The most common classification system is according to the summer and winter seasons, which isn’t really valid in temperate climate regions like California, where many types grow virtually year-round. Summer squash: Summer squashes have soft edible shells and small edible seeds. They are picked when still immature and tender-skinned. Summer squash vary widely in shape and skin colour – but all types have a mild, delicate flavour. Some of the most popular kinds of summer squash include the yellow crookneck, a pale yellow, sometimes bumpy-skinned squash with a curved neck; and pattypan, or scallop, which is disc-shaped and pale green with scalloped edges. 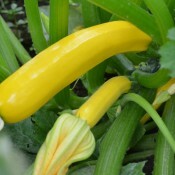 Most popular among the group is the zucchini (Italian squash or courgette) – typically straight, slim, and dark green. 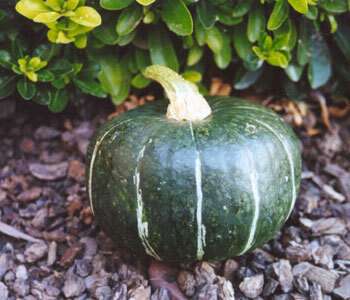 Winter squash: Winter squashes have hard inedible shells and big seeds, some of which can be roasted and eaten. They are allowed to reach maturity before being harvested and will keep longer than summer squashes. These bountiful and delicious squashes are available in a truly amazing variety of shapes, forms, and colours. 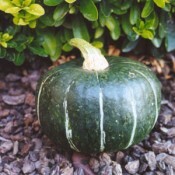 The most popular winter squashes include the pumpkin; acorn squash which is blackish green with shades of yellow and a shape like a large acorn; butternut, which has cream-coloured skin, deep orange meat, and a large cylindrical shape; and kabocha, which is blackish with shades of orange and yellow. Spaghetti squash falls somewhere between summer and winter squash in skin hardness and when cooked, the flesh forms strands that resemble spaghetti. Squash are great companions to corn, lettuce, melons, and pumpkins. Marigolds, nasturtiums, and oregano help protect squash from various pesky insects. Do not plant near Brassicas (i.e. broccoli, cabbage, cauliflower, etc.) or potatoes. Summer squash are high in vitamin C and extremely low in calories-a cup of cooked squash is only about 25 calories.Winter squash are low in sodium and an excellent source of vitamin A. The calorie count of cooked winter squash ranges from 90 to 130 per cup. All squash are high fiber. 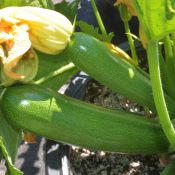 Summer squash: When the fruit appear, check summer squash (especially zucchini) daily because the quality declines if the fruit become oversized. Most summer squash plants have hairy or spiny stems and leaves. To avoid skin irritation, wear long sleeves and gloves when harvesting. Use scissors, pruners or knife to cut squash from the plants leaving about 1 inch (2.5cm) of stem attached.Winter squash: When winter squash and pumpkins are ripe, the rind turns slightly dull. The rind should be tough enough to withstand light pressure. Cut the fruit off the vines, leaving 2 inches (5cm) of stem attached to the fruit. Handle them carefully. Summer squash: Store the squashes unwashed in plastic bags for up to four to five days in the refrigeratorWinter squash: Cure squash at 85-90°F (29-32°C) for several days to promote hardening of the rind; then move the fruit to a cool area for storage. Ideally, the storage area should have temperatures of 50-60°F (10-15°C) and humidity of 50 to 75 percent. 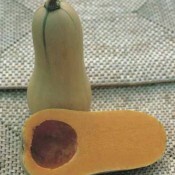 Under the right conditions, the squash can be stored for 2 months or longer. This attractive bright yellow-fruited variety has a strong plant frame and tidy habit. It has attractive foliage and produces lots of bright yellow fruit throughout the season. It is ideal for pot and container production or open ground. The large yellow flowers are ideal for use as edible flowers or for stuffing.